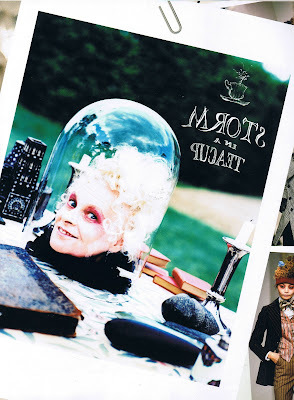 As Vivienne Westwood cares about the problem of global warming, she imagine a society of jungle-dwelling eco-warriors. The clothes that resulted are the warriors' uniform. The pattern on the clothing are some flowers, snakes and butterflies. The theme is 'Do it yourself'Vivienne do this show because she was inspired by the rainforest. she want to save the rainforest and encourage us not to consume, that is "less consume, but do it yourself". Vivienne Westwood want to arouse our awareness about the envrionment issue in her collection "+5°," the meaning of "+5°" is that 5 degrees are counted to rise as CO2 levels skyrocket. Colour scheme: Mono-chromatic as well as split complmentary in high value. 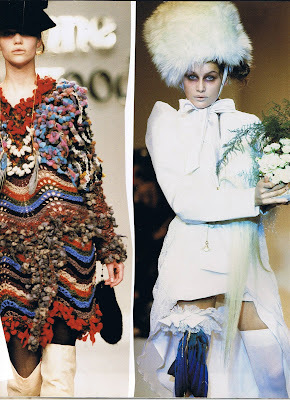 With the trend of the recent collections, I thinkthe theme of the 2010 A/W Collection , Vivienne Westwood will still concerning about the environment issue. 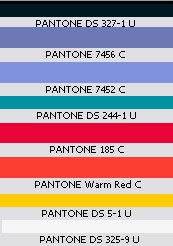 Therefore , I forecast that some colors of natural will be used in the 2010 A/W Collection , such as Green , Blue , Yellow and red. As I founf that Blue and Yellow were the key color of the 2009 S/S and A/W key color respectively , so I forecast Vivienne Westwood will use Green as the key color of the 2010 A/W Collection . 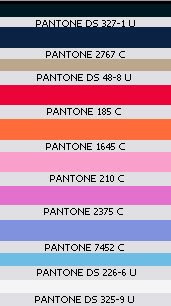 In the aspect of the color scheme , I found that Vivienne Westwood love using Mono-chromatic , Analogus and split complmentary Color scheme, Thus, I forecast Vivienne Westwood will use these there color scheme in the collection. As I forcast that Vivienne Westwood may use Green as the key color in the collection, so I think Green color will be used for the Mono-chromatic color scheme. 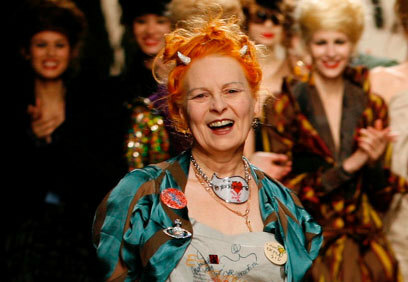 For the analohous Color Scheme , I forcast Vivienne Westwood will use Red& Orange ; Blue & Green. For the split complmentary Color scheme, I forecast Yellow,orange and blue will be used. 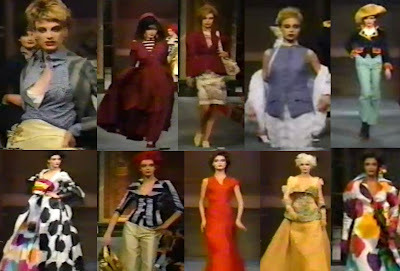 Besides, I found that Vivienne Westwood used the Achromatic Color Scheme, which is Blacks, Whites & Grays , in nearly all her collections. Therefore I forecast the Achromatic Color Scheme will still be stayed. Moreover, I forecast Vivienne Westwood will use color in High Value in the period of the financial tsunami , since in my point of view, high valu colors mean strong and tough. Therefore I forcast Vivienne Weatwood may want people after wearing her designs will be more tough and stronger to overcome the financial difficulty. 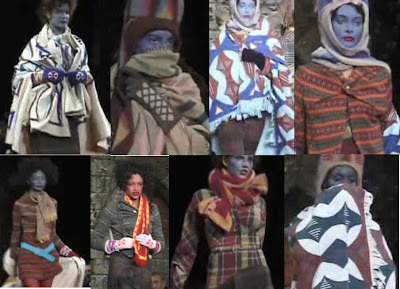 The above is my Color Forecasting of the Vivienne Westwood 2010 A/W Collection. In this Project I am repsonsible to analysis the color schemes in 90's collections. 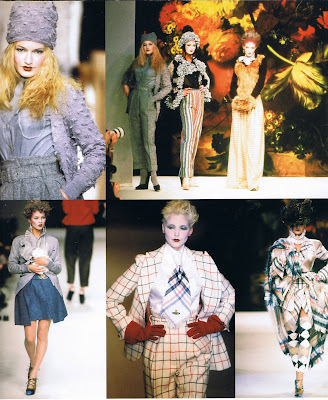 I think Vivienne Westwood use fuuny way to present her color ideas in this collection. e.g. Models face were painted in blue and wore orange dress to create the Complemntary Color effect. Vivienne Westwood use a blue belt matcheing with the orange dress to creat a Complemntary Color effect. This model 's face was painted in red and wore a orange scarf to creat a Analogous Color effect. It collection was featured asymmertic cuts, chalk-striped single-breasted jackets and trousers in taupe pinstripe, brocade waistcoats and shirt and ties in the same striped poplin, in an innovative interpretation of traditional english memswear. Westwood exampled , ' I just loved those windows in Jermyn Street, with all that shirting fabric. Menswear is so brilliant, with all those different stripes. I love it together, so I made a tie in matching fabric -- it had three or four buttons that you could undo, then you could wash and iron the whole thing and button is all back. The collection also featured jackets with pleated or flaring backs which draped from the shoulder in another modification of the sack-back. 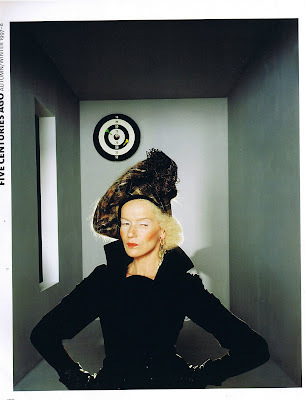 Vivienne Westwood loves using Blacks , Whites and Grays to creat the Achromatic Color effect. In the first part of this fashion show, i found that most of the dresses used the Achromatic Color scheme. We can see that Vivienne Westwood used Green as the key color of this dress and using red color to crearte a contrast color effect. 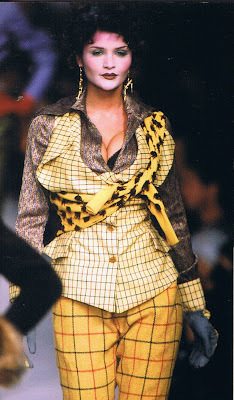 Moreover , in this colloection I found Vivienne Westwood used Analogous Color Scheme so as to create the feeling of harmony. The left one is using different value of blue and the right one is using different value of red. 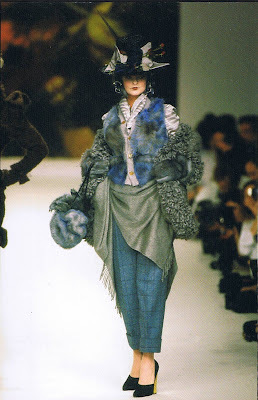 Inspired by the seventeenth century French essayist, La Rochefoucault, she revisited this theme in her Spring/Summer 1996 collection, Les Femmes ne Connaissent pas toute leur Coquetterie (‘Women do not understand the full extent of their coquettishness’) with body extensions such as padded busts and hips and metal cage bustles creating an exaggerated hourglass silhouette that took some of her designs close to the realm of the unwearable. Others however, such as the sumptuous, strapless sack-back Watteau evening dress of tumbling green and lilac silk taffeta (famously modelled by Linda Evangelista), brought these exaggerations together in an unmistakably contemporary statement. One of the star garments of the collection was the 'Queen of Sheba' dress. Inspired by Pagan themes in Tiepolo's paintings and embroidered woth eads and ostrich feathers by the corsetier Mr Pearl, it was worn by the actress Demi Moore. 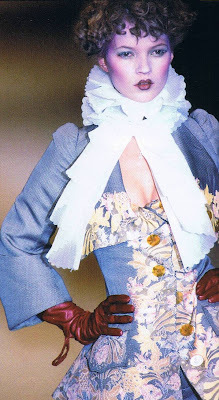 This 'Watteau' evening dress in green silk shot with lilac taffrta with a burgundy bow had been worn by Linda Evangelista and formed a compelling publicit image. The below outfits are using Achromatic Color Scheme , which is Blacks , Whites and grays , to create the feeling of elegant. 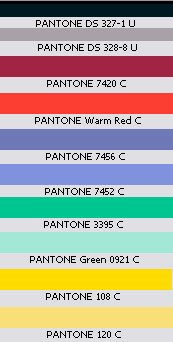 The below outfits are using Analogous Color Scheme , the left one is using Blue and green whcih is one the same value ; the right one is using gray and blue. The below outfits are using Triad Color Scheme . The left one is using Red , Blue and Yellow color which in a high value while the right one is also using Red , Blue and Yellow color but in a low value. 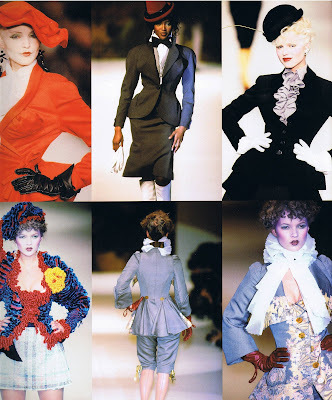 I think that Vivienne Westwood use the Triad Color Scheme is to create a exaggerating feeling, as Westwood's interest in exaggerating the figure , asn the Triad Color Scheme can n=match with the outfits. The below outfit is using Mono-chromatic Color Scheme , which is using different value of the smae Hue -- Yellow. We can see that the shiet is using light yellow and the trousers is using high value of yellow. 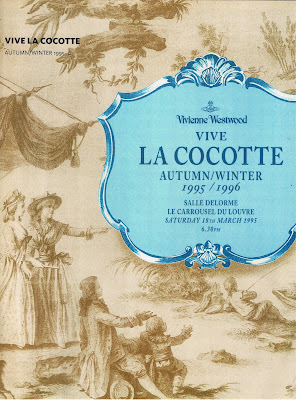 The inspiration for Vivie la Cocotte was the 17th century courteasan, Ninon de l' Enclos. 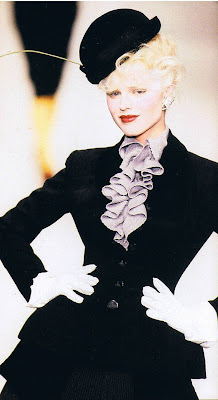 Westwood's interest in exaggerating the figure was now taken to the extrme, using both a padded bust and, replacing the bustle cushion, a metal cage which was tied with small bows to a pull-on elastic foundation with suspenders. 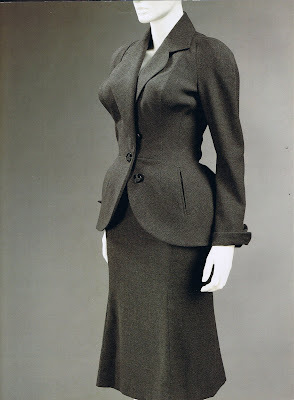 This dark grey wool ' Metropolitan' jacket and skirt was based on a Christian Dior suit that Westwood studied in the Metropolitan Museum of Art, Nrw York. It is tailored to fit oer the exaggerated from created by Westwood 's cage bustle.